While Kaycee Binns was waiting tables at a cafe, she was dreaming of how to become a metalsmith. One day, she was invited to a baby shower, and not having a gift to give, she decided to make one herself. Remembering a story her grandmother had told her as a little girl, Kaycee melted down some left over sterling silver and created a rabbit-themed baby spoon. Her gift was such a hit that she decided to devote herself to her passion full-time. Her charming pieces—touching tokens, witty paperweights, and cheeky flasks—are hand-cast in Atlanta. 4" L x 4.25" W x .75" H, 6 oz. This item has been discontinued. When it sells out, it will no longer be available. This flask is great! I've been looking for one that reflects my personal style for a long time, and the composition notebook is perfect. I finally purchased it to sneak alcohol into a cash-bar wedding ($7 for one weak drink? I don't think so!). The 6oz size is more than enough for a lightweight like me, and even provides enough to share. The composition notebook decoration is metal and it appears to be stuck onto the flask well, but only time will tell. I wish it had come with a funnel as many flasks do, to make filling it up easier. Very cute little gift for the writer in my life, who also enjoys time with a cocktail or two. Made him laugh right out of the bag and looks very cute on his bar, when he's not toting around with his books. This was a great fun gift for one of my close friends. She studies a lot, and I thought it would be a funny way to say, "you work hard, so you should play hard too!" Great twist on classic gift. I knew I wanted to get my lil' brother-in-law a flask, and he is kind of hipster-ish. So this was perfect! I bought this for my better half who loves the composition notebooks and thinks flasks are cool. It was exactly what the product description said it was and luckily was shipped and received in plenty of time for Christmas. We haven't put it to use but it looks fantastic. I tend to try to think outside the box when it comes to gifts for loved ones. My wife is a writer, and she loved the character Bobby Singer from the show "Supernatural." I teased her that I found a gift that combines her love of writing with her love for Bobby. She was very pleased with the present. As cool in person as in the picture. This was a gift for someone who has everything. I bought this as a gift for my administrative assistant who was moving on to a new role. She laughed just as hard as I did when I first came across the flask on the site! This was a present for a friend - she loved it! Super cute nerd gift. A very clever gift idea. 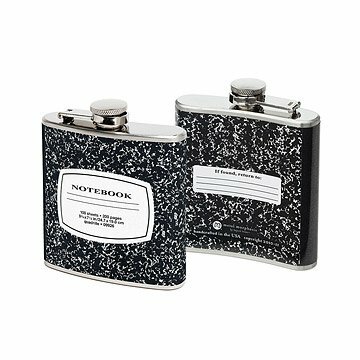 This stainless steel hip flask is decorated to look like an old-fashioned school notebook.